Am I the only one that will buy a particular, somewhat rare, yet hardly-ever-usable spice for ONE recipe…then just let it sit in the cabinet indefinitely because I literally don’t know what else to do with it? But I’m still guilty of it. I bought saffron once. It’s main use was to make St. Lucia Buns, but I told myself I’d use it to make paella later. Did I make the paella? No. But the St. Lucia Buns turned out fantastic, and I have made them again since that first time. The first time I brined a turkey, I bought a small bottle of whole juniper berries that were supposed to go in the brine. Prior to that, I wasn’t even sure of what a juniper berry was supposed to even taste like. The turkey turned out fine, but I still haven’t touched them since then, which was…November of 2014. I buy vials of whole star anise to make my favorite Cranberry Clementine sauce. Do I know anything else to do with whole star anise? Heck no. But it gives an irreplaceable flavor to the cranberry sauce, so I buy it anyway. 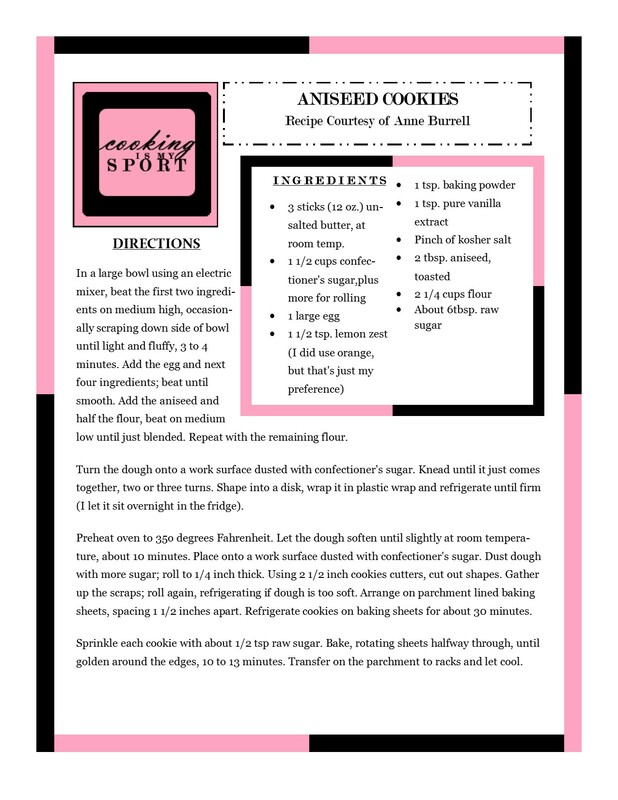 When I looked over the recipe to make my Springerle cookies, I saw that I would need something called Baker’s Ammonia. Had I EVER used Baker’s Ammonia before? Nope. But for the sake of my cookies, I bought some. I used 1 tsp for the entire batch. I still have just about the entire 2.7 ounce bottle left….and no idea what else to do with it. I bought orange blossom water to make my very first batch of Baklawa. I put 2 tbsp worth in the syrup. The problem is that it was from a 10 ounce bottle….and sadly, I still have not touched it since then. Whole cloves. Whole peppercorns. White pepper. Whole cinnamon sticks. Pomegranate molasses. Sumac. Fennel seeds. Those are just a few of the spices I currently have in my cabinets that I purchased for maybe 1 or 2 recipes, and have yet to find other uses for. Another one I should add to that list would be whole aniseeds. Why would I buy whole aniseeds? I bought them for last year’s 12 Days of Christmas series where I made Biscochito cookies…and to my shame, I have not found another use for them since then. Or should I say, since now– today’s recipe for Day 7 of our series. Anise is a flavor that people typically either love or hate. If I had to describe it, I would say that it’s mildly reminiscent of licorice. But even if you THINK you don’t really like the flavor of anise, I still think you should give this recipe a chance. These cookies are that good. Also, if you’re like me and you have a 2 oz. bottle of aniseed sitting in your cabinet, then allow me to give you just the recipe to put those suckers to good use. It’s well worth the two whopping tablespoons that goes in this dough. I already knew when I rolled it out that I would love these cookies; the dough just ‘felt’ good to me. It’s very smooth and pliable without being too sticky. The cookie isn’t chewy, but it does have a buttery, melt-in-your-mouth texture that I just loved. The citrus zest that you choose to include (whether it’s lemon or orange) also gives a very pleasant balance to the flavor of the aniseed. These really remind me of the type of cookies you would serve at a tea party alongside some tea, coffee or hot chocolate. Or, of course: alongside some milk for Santa. 3 sticks (12 oz.) unsalted butter, at room temp. In a large bowl using an electric mixer, beat the first two ingredients on medium high, occasionally scraping down side of bowl until light and fluffy, 3 to 4 minutes. Add the egg and next four ingredients; beat until smooth. Add the aniseed and half the flour, beat on medium low until just blended. Repeat with the remaining flour. Turn the dough onto a work surface dusted with confectioner’s sugar. Knead until it just comes together, two or three turns. Shape into a disk, wrap it in plastic wrap and refrigerate until firm (I let it sit overnight in the fridge). Preheat oven to 35o degrees Fahrenheit. Let the dough soften until slightly at room temperature, about 10 minutes. Place onto a work surface dusted with confectioner’s sugar. Dust dough with more sugar; roll to 1/4 inch thick. Using 2 1/2 inch cookies cutters, cut out shapes. Gather up the scraps; roll again, refrigerating if dough is too soft. Arrange on parchment lined baking sheets, spacing 1 1/2 inches apart. Refrigerate cookies on baking sheets for about 30 minutes. Sprinkle each cookie with about 1/2 tsp raw sugar. Bake, rotating sheets halfway through, until golden around the edges, 10 to 13 minutes. Transfer on the parchment to racks and let cool. Now thats a creative way to use anise see. I have a big jar of them in my spice cupboard. Why don’t they sell small jars or single serving or something, The cookies looks great and I bet they are really yummy. I dunno Suzanne,maybe it’s more $ for them if they sell them in large amounts lol but if you needed a use for yours I gotta say I highly recommend this recipe. They ARE yummy. Thank you!